THANKS: Neville and Anna would like to thank all those who assisted practically to make the Coffee Morning on August 2nd such a success. Thanks also to those who attended, making the event a very enjoyable occasion. 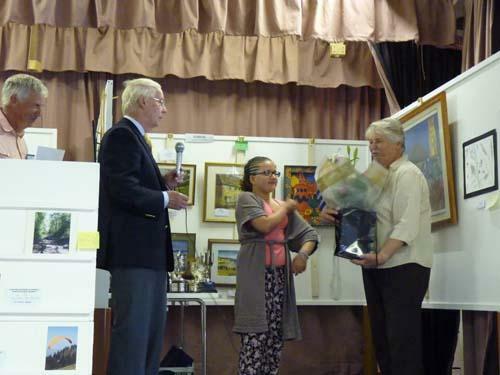 £191 was raised for St Mary's Church, for which the PCC is very grateful, but as important, was the opportunity to meet so many friends socially. FUN DAY REPORT: FUN DAY was a great success, fostering community spirit and generating a lot of fun in the sun! Thanks to the Fun Day Committee and to the 75 volunteers who gave up so much of their time and energy to make it happen. Thanks also to 16 children and adults who painted the playground fence beforehand. It looks great. Thank you to the Red Arrows for the wonderful Fly Past and the prize for our raffle. Finally, a special thank you to Carol, who took on so much in support of her grumpy husband. [By the way, Mike said that!] 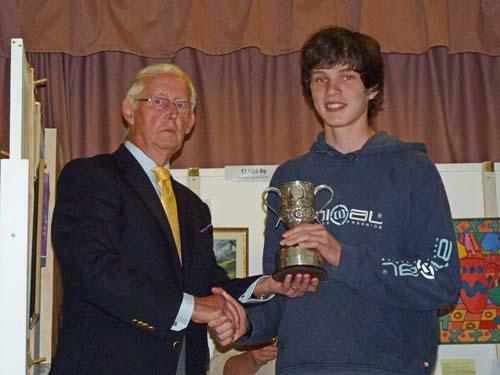 As well as having a grand time, between us we made over £1500, which will be distributed in support of local good causes. On a final note, what does everyone think about creating a memorial to mark this day of happiness and sadness? Your ideas would be very welcome. WED 7th SEPT: PARENT & TODDLER GROUP at the COMMUNITY ROOM at NETHERHAY CHAPEL starts the new term. Sessions from 10.00am - 11.30 a.m. each week. New members welcome. For more info, contact Beryl. The members spent a delightful evening at the local deer park in August. All those who attended enjoyed themselves. Watch out for our next outing! 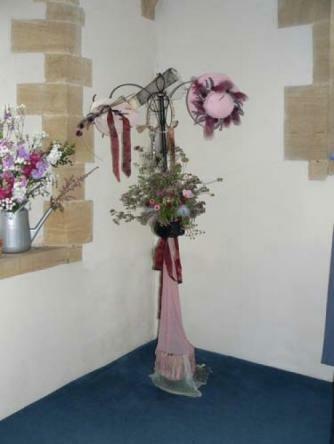 MON 12th SEPT - ART CLASS STARTS - 2 to 4pm at Netherhay Chapel. For seasoned painters and those that haven't touched a brush for some time! If you are interested in joining our friendly art group, please contact Jenny. 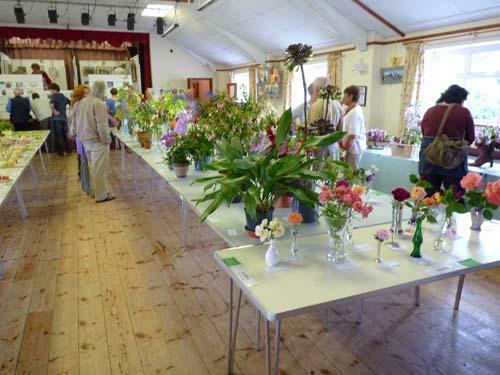 WED 14th SEPT: LIGHT LUNCH at the Village Hall from 12.30 to 2.00pm. A choice of fine home made soups with bread and cheese table, all for £3.50. Children’s Story Time with Carol 11.15am - Everyone welcome. 7th ANNUAL MACMILLAN COFFEE MORNING - The World’s Biggest! on FRIDAY 30th September from 10.00 a.m. at The Pin House on Chard Road. Please come and support this very worthy event. Thank you. SUN 4th SEPT: QUIZ NIGHT from 8.pm. Bring a team, or join one on the night. SAT 10th SEPT: Live Country & Western music from JEFFERS ‘n’ JOHN from 9.pm. TUES 20th SEPT: FOLK NIGHT from 8.pm. For Musicians, Singers and audience, too. Everyone is invited to share in this seasonal service of thanks. Two hot courses followed by entertainment. Please book your tickets from Christabel or Beryl. 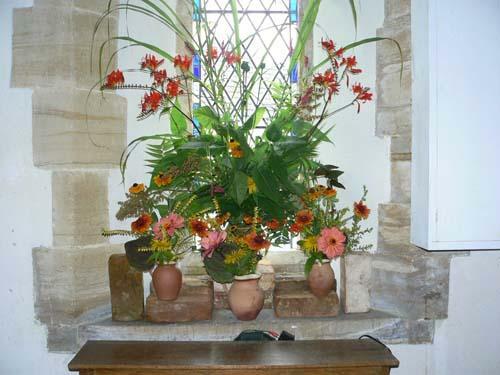 HELP REQUIRED: CHAPEL AUTUMN CLEAN: Can you help out for a few hours? If so, please call Beryl. 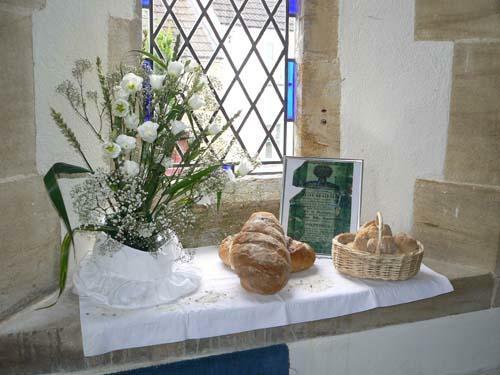 To book the Community Room/ Chapel, also call Beryl. VILLAGE HALL NEWS: If you have been to the Hall recently you will have seen that the benches have been removed from the walls in the Village Hall. This has been done in an attempt to ease the storage problems and to reduce the constant migration of chairs between the hall, the stage and the changing rooms. This is for a trial period of 6 months. The committee will then consider the pros and cons and decide the way forward. And you may have noticed, we now have black-out blinds at the windows. The old cardboard sheets used during Panto Performances have been discarded!!! I find it very difficult to put into words the combined emotions that resulted from our day of Community and Fun on 20th August which ended so sadly with the news of the tragic accident during the Reds return to Bournemouth after the fly past over Drimpton. Suffice to say that our feelings on the Sunday morning were of sadness rather than of happiness and celebration. I took the liberty of sending the following message to Flt. Lt. Jon Egging’s wife, his family and the Red Arrows, which will be included in the Scampton book of Condolence. "Drimpton villagers and the surrounding communities were ecstatic when the Reds performed their Fly Past at Drimpton Village Hall and Recreation Ground in support of our village fete which raises money to support local good causes. Our little village, of 350 people, felt very privileged that the world famous aerobatic team had taken time to support our cause. It was a fitting example of the wonderful support the Red Arrows give to all of our local communities, however small. We were stunned into silence when some 30 minutes later we heard of the news of the tragic accident at Bournemouth Airport. I have received hundreds of messages of condolences to pass on to Emma, Jon’s family and of course to Red 4’s extended family, the RAF Red Arrows. We are shocked and saddened by Jon’s tragic death and our thoughts and prayers will be with you all at this difficult time." but generally pretty cool. In fact the coolest August for over twenty years ! Sunday 28th August saw the first car treasure hunt in Drimpton. Starting out from the village hall 21 cars ventured around Drimpton and surrounding villages looking for clues. The aim to complete all questions and be back to the hall in time for a barbecue, unfortunately one or two cars deviated from the route but eventually smelt the fine food being cooked and hastilly arrived back in time for a burger and drink. A big thanks for Tracey who set a great course. Next year we look forward to another go. Very good photographs this year. Good standard for everything (Alyson Stone). 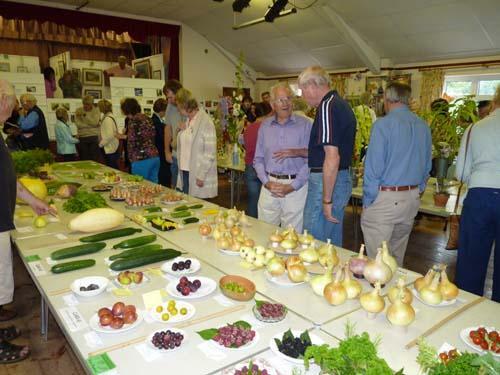 Really enjoyed the wonderful displays of flowers and veg (Rosanna Reeves). Great day not to be missed! (Linda Smith). 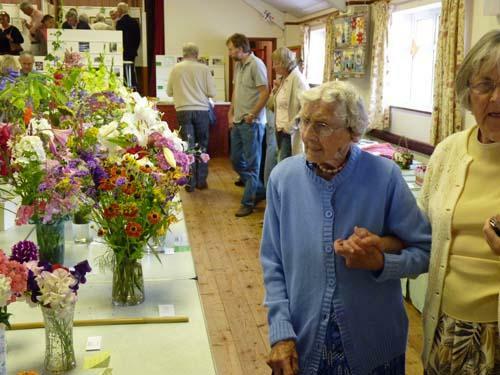 Brilliant flower show. Abigail always loves taking part (Helen Lock). Highlights of the day for me were the amazing floral arrangements and the additional space for lunch/teas. The lunch and cakes were wonderful - as ever and the extra space made moving around the exhibits so much easier for the afternoon visitors. So, as you can see, the marquee was a big success enabling everyone to appreciate the show to its full potential. A very happy and successful day. 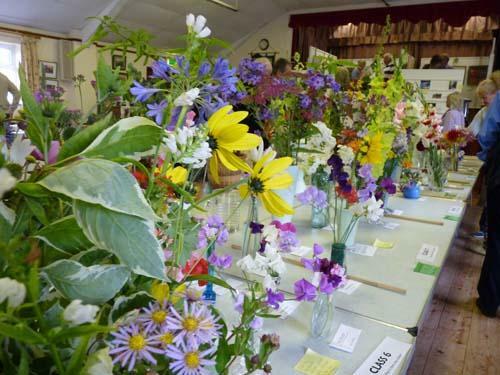 Another fabulous show took place on Saturday 13th August with 482 entries submitted. 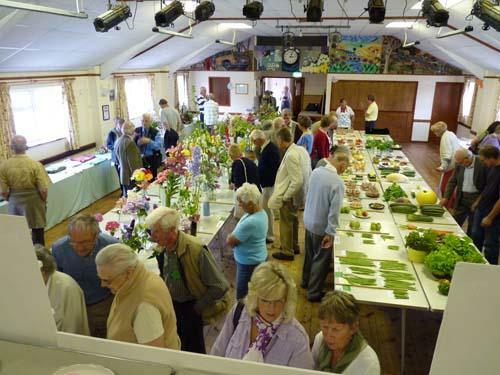 The judges, visitors and members all enjoyed a splendid day with a superb standard of exhibits being shown. 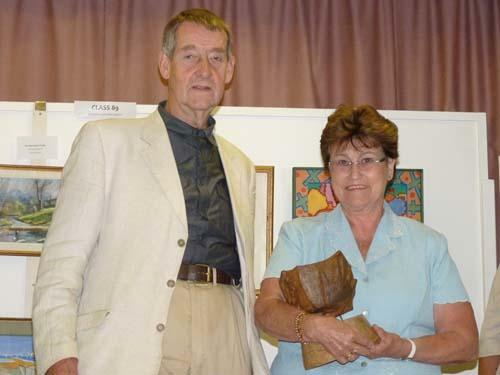 This year there was a special award for Art in memory of Diana Sprent and the Diana Sprent trophy carved by Roger Franklin was won by Val Jones. 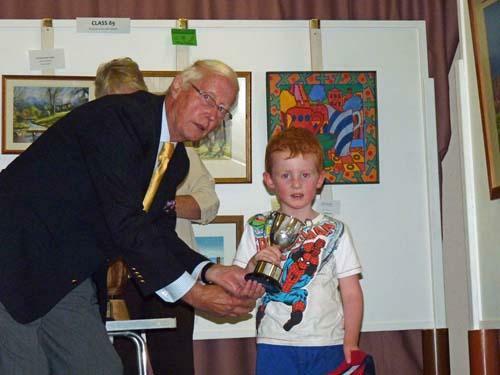 The photography was won by Tom Beck, one of our younger entries and Matthew Medley was the star of the show when he collected his cup, announcing he had had his 6th birthday the previous day. 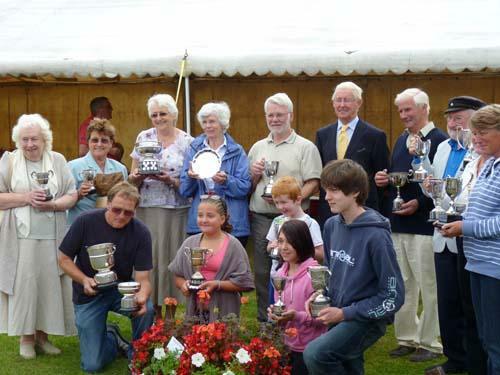 Hannah Goffe won the Dummett Cup for the heaviest crop of potatoes for the childrens' entry and Rosemary Clayton won the Shepherd Cup for the heaviest crop in the adults' entries with 3.750 kg of potatoes from one seed potato collected in February on Potato Day. After a wet start Drimpton Fun Day got under way with everyone enjoying themselves, the weather cleared and by mid afternoon the sun shone from a cloudless sky. The Red Arrows did their fly past on schedule but then came news of a Red Arrow down near Bournemouth Airport. Everyone prayed and hoped the pilot was OK but then came official news that he had died in the crash. The thoughts and condolences from everyone in Drimpton are surely with the wife and family of Flt Lt Jon Egging on their tragic loss. Ref. Andrew's entry (was it a Red Arrow?). No, it was a Hawker Hunter doing a practice display. I believe (someone correct me if I am wrong) this was the multi-coloured 'Miss Demeanour' privately owned and displayed at many air shows in the south. 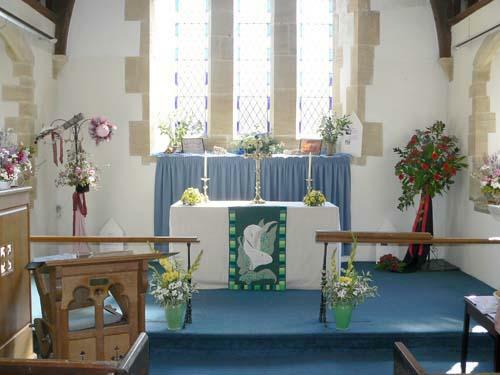 The weekend of 23/24th July saw the church decorated for the annual Flower Festival, this year our theme was ‘Who Were We’. We had borrowed the title from the book written on the village by Andrew Pastor, and linked it to the fact that this was census year. 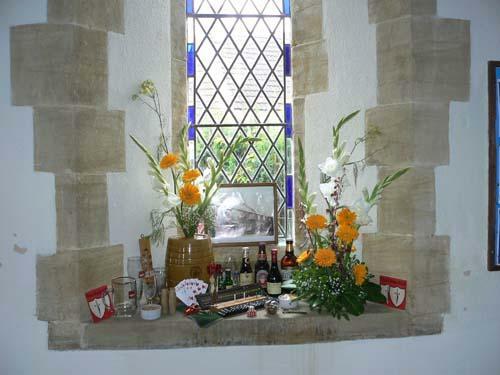 The windows were decorated with flowers and adorned with items used or made by workers of our village in years gone by. We had used past census records to find out about the workers and employers of time past, the result was 13 different vocations on show. The weekend was finished of with our Methodist friends joining us in United Songs of Praise on the Sunday evening. The congregation was in good voice for the 8 hymns chosen . The service was led by Neville Adams keeping it a very much a village celebration. At the end of the service many people stayed chatting and admiring the flowers before leaving. Was it a Red Arrow? Earlier this afternoon, Sunday August 14th, a lone jet roared over the village and proceeded to do a pair of tight loop-the-loops (if not more) diving and pulling up before hurtling skywards. It then linked them together with criss-crossing passes and a roll. For a few minutes the jet - which seemed to be a bit big for a Red Arrow - filled the sunny sky with noise and its solo acrobatics. Was the plane doing a dry run for next Saturday's Fun Day? Was it in the wrong place all together? Was the pilot just saying that whatever the Red Arrows could do, he could do too?